The rain stayed away for the support class races at the Sachsenring for the German Grand Prix weekend, with Moto3 out to play first on race day. Winning joy again for Miller. Red Bull KTM Ajo rider Jack Miller had ruled the weekend and after taking pole and lead the race from start to finish, fending off his challengers, first from Alex Marquez and then from his race companion out front, Brad Binder. The Australian teenager remained in control and untroubled by his rivals as he took his fourth win, just his second from pole. He also equalled an Australian record for wins in the lightweight class in one season, the last time an Australian scored four wins in a year was Tom Phillis in 1961, who went on to win the world title that year. 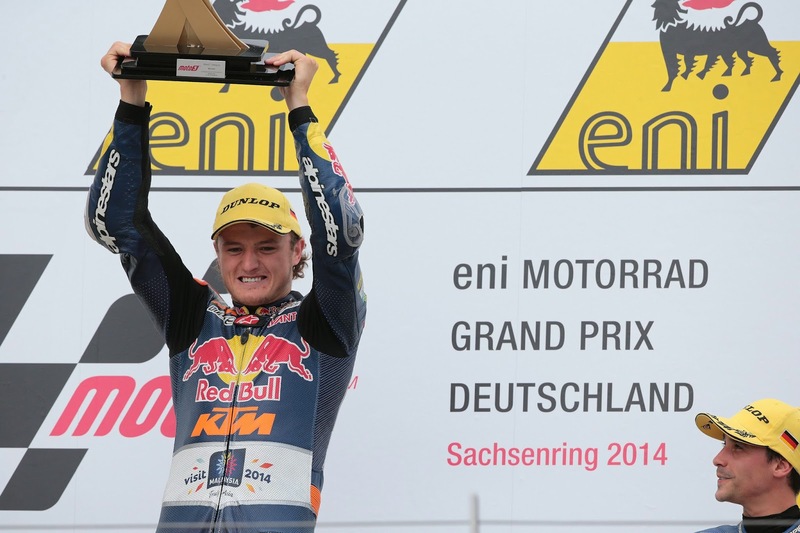 Brad Binder’s second was his first ever podium finish and also the first for his team, Ambrogio Racing. The battle behind the South African’s Mahindra was tense with the experience of Alexis Masbou helping his Honda into third for Ongetta-Rivacold, giving him his second podium at the same track where he took his first and nudging Alex Marquez into fourth. Danny Kent finished fifth, his best result since rejoining Moto3 on the Husqvarna after working hard to stay at the front of the field. The SaxoPrint-RTG team had a great day at their home track after a poor showing in qualifying with Efren Vazquez rallying for sixth, just one place ahead of team-mate John McPhee in seventh, also his best result to date on a strong day for the Brits in the class. McPhee had qualified down in 28th. Isaac Vinales took eighth for Team Calvo ahead of a best finish of ninth for Matteo Ferrari for San Carlo Team Italia. Aspar’s Juanfran Guevara also made the top ten. The remaining points went to Team Calvo’s Jakub Kornfeil in 11th, top German Philipp Oettl in 12th for Interwetten, a seasons best first points scoring finish of the year for Arthur Sissis’ Mahindra in 13th, the third Calvo bike of Eric Granado in 14th, with Enea Bastianini scooping up the final point despite a early crash for Junior Team Go&Fun. Both Romano Fenati and Alex Rins’ championship hopes took a blow courtesy of early crashes, Miller now leads the title hunt into the summer break by 19 points from Alex Marquez in second. Moto2 saw a popular win for Dominique Aegerter as the Swiss rider won the drag to the line after a race long battle with Mika Kallio. The Technomag carXpert riders first win comes from pole at his 129th start – but his 77thtime lining up on the Moto2 grid – a timely match of his racing number. It is also the first time Suter have won this season, their last victory came at the final round of 2013 when Nico Terol won at Valencia. Mika Kallio’s second place puts a sizable dent into his Marc VDS team-mate Tito Rabat’s Championship lead, cutting it to 19 points as Rabat again failed to make the podium in Germany. The battle for third was tight between the next four riders and was snatched by a determined and confident pass by NGM Forward rider Simone Corsi on the closing corners, with the Spaniard forced to settle for fourth. Paginas Amarillas HP 40 Pons rider Maverick Vinales hacked through the pack in the early laps from 13thon the grid for an impressive fifth, the top rookie by one place. Franco Morbidelli continued to see success at the Sachsenring and while very much in the hunt for third the Italtrans rider had a chance to show his qualitiy, finishing a credible sixth as the race drew to a close. The Swiss had a strong showing in Germany. Behind Aegerters win Randy Krummenacher finished seventh and Tom Luthi ninth, the pair sandwiching the Forward racing bike of Mattia Pasini, who took eighth. Xavier Simeon completed the top ten finishers. The race for position further down the field was also tight with Tech 3 team-mates Ricky Cardus and Marcel Schrotter next to cross the stripe in 11th and 12threspectively. Schrotter was also the top German finisher – both Jonas Folger and Sandro Cortese retired with bike issues. The final points went to Louis Rossi in 13th for SAG, Pons rider Luis Salom in 14th and AGR’s Axel Pons in 15th. For the full Moto3 result click here, and for Moto2 click here. Previous Previous post: Moto3 and Moto2 qualifying round-up: Miller back on top and Aegerter’s first pole at a changeable Sachsenring.